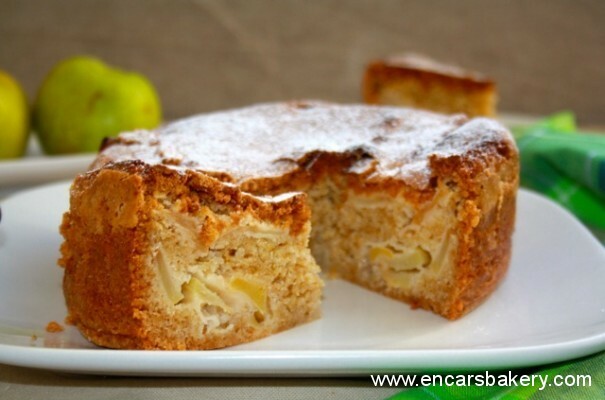 Today I propose a simple and delicious cake, and the latter has much, I assure! As you know, the combination of spices in the pantry offers plenty, and a biscuit dough as juicy as it is a delight. And Apple is the perfect, at least for me that, as I have said many times, I find the tastiest fruit and perfect for baking. If you want to see other spicy cake I posted a few months ago, pinchad aquí. And I tell you and how to prepare today. Prepare a springform pan 18 cm, the greased and forramos. Sift the flour and mix with spices. Booked. Peel, discouraged and cut apples into thick slices. Sprinkle with lemon juice and reserve. Beat butter, will be at room temperature, with sugar. Beat eggs and add slowly to the mixture while continuing to beat until it forms a light and fluffy cream. Add the flour mixture to the cream and spices previous, gradually, and mix well. We took half of the mixture into the prepared pan and, above, split the apple pieces. We cover it with the remaining dough. We put in the oven, preheated to 180 º C, about 90 minutes or, until when pierced with a skewer, comes out clean. Once out, let cool the cake in the pan and, before serving, sprinkle with icing sugar. I hope you liked! You see how simple it is, there is no excuse not to do so and enjoy a rich cake really rich.